Disable the warning message that says “The Publisher Could Not Be Verified” when you run certain files in Microsoft Windows. Note: This tutorial is only valid for version of Windows that contain the Group Policy Editor such as Windows 10 Professional. Type “gpedit.msc“, then select “OK“. Go to “User Configuration” > “Administrative Templates” > “Windows Components” > “Attachment Manager“. Open the “Inclusion list for moderate risk file types” setting. 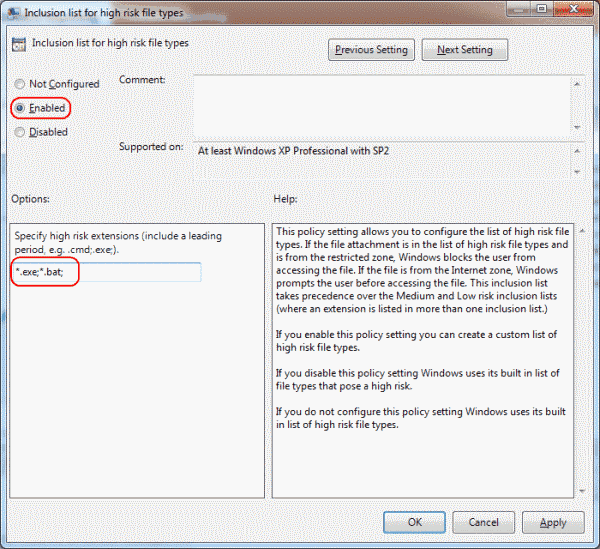 Set the policy to “Enabled“, then add “*.exe;” or whatever the file extension you are using to the “Specify high risk extensions” box. Look for an entry on the right side for “LowRiskFileTypes“. If it doesn’t exist, you will need to create it. To do so, right-click on “FileSystem” and select “New” > “String Value“. Give the value a name of “LowRiskFileTypes“. Press the “Enter” key when you are done. Right-click the “LowRiskFileTypes” entry and click “Modify“. Modify the value by including file extensions, with periods, separated by semi-colons .bat;.exe would add batch and executable files. This should disable the “Publisher Could Not Be Verified” messages from appearing for that file type in the future. While running the VB scripting file “filename.vbs”, It navigates to me “View and track your downloads” pop up window n windows 7 and when i try to open it, then it displays error message “The program’s publisher couldn’t be verified. Are you sure you want to run this program”. I did all the setting related to LowRiskFileTypes and HighRiskFileTypes in registery settings of computer. But could not help it.